Executive Director of the Emirates International Accreditation Center (EIAC), Vice Chair of the OIC/ SMIIC-Accreditation Committee and Vice President of the Arab Accreditation Cooperation (ARAC). She has extensive experience in conformity assessment tasks, analytical chemistry and food safety. She has been in several leadership positions, before leading the Emirates International Accreditation Center, formerly Dubai Accreditation department, in 2008. She steered the modernization of conformity assessment bodies and testing laboratories in Dubai and UAE. She was the head of the Food lab section of Dubai Central, head of chemical testing unit of engineering materials, Quality Officer and Technical Assessor. 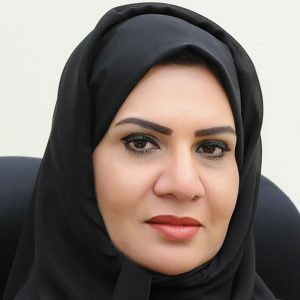 She established and managed a numerous number of food safety projects in the Gulf region and UAE through her position as vice Chair of Dubai Food Safety Committee. Currently and among the most important achievements, she is participating and sharing the establishment of the International Halal Accreditation system for supporting the Islamic economy development in addition to Dubai capital of Islamic economy.